Donald Czyzyk was on his way to work at the Happy Tails Humane Society in Illinois last week when he spotted something odd. 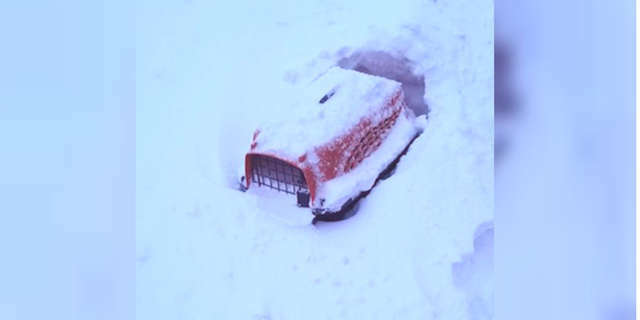 Near the entrance to a driveway there seemed to be a plastic pet carrier, half-buried in snow from having been dumped snow on from a snow plow before. Czyzyk decided to get closer and look for himself when he spotted an ear; there seemed to be an animal inside, completely covered by snow. 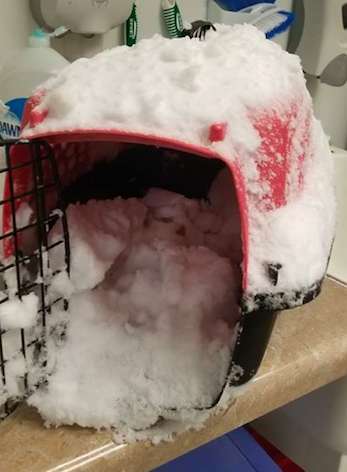 Czyzyk, being a rescue’s veterinary assistant, decided to dig out the animal from the snow, who had clearly frozen and been suffocated from the surrounding. Once he freed the carrier, he began to dig the inside of the pet carrier. To his surprise, a grey cat emerged from there, alive, but completely covered in ice and snow. Czyzyk said that the cat did not appear to have any injuries but she was “soaking wet from the snow and ice”. After she was safe on the shelter, the staff decided to name her winter for all the struggles she went through. They soon discovered that she has a really fun personality and likes to rub her head on things. Since she is one year old, the staff managed to find her a home almost immediately. She will be going home this weekend, and in the mean time she is safe and warm in the shelter. Czyzyk said that the shelter staff had been really nice to the kitten. The family that has adopted her are personally known by the staff too. They consist of a couple and another dog. The rescue has in addition encouraged anyone who might know who is behind such a horrendous act come forward. They are even offering a reward.